First-half goals from Danny Galbraith – his second since joining the club in December – and top goalscorer Blair Henderson’s neat finish – his 36th of the season – ensured the Citizens left Shielfield Park on Saturday with all three points. 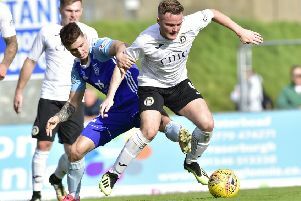 Peterhead ran out 2-1 winners over Cowdenbeath – City visit the Blue Brazil this weekend – while third-placed Clyde remain a point behind James McDonaugh’s men following their narrow win at struggling Albion Rovers. “It’s a great win for us,” McDonaugh said. “It’s easy to say that we should be winning these games but these teams at the bottom of the league and are fighting for their lives. McDonaugh was pleased to finally put the ghost from their last visit to Berwick to bed when they relinquished a two-goal lead in the dying embers of the match to leave with just a point for their efforts. “I didn’t have any doubt in my mind we’d take the points last time and look what happened,” he said. “But I think on Saturday we showed we learned from that experience to see the game out comfortably. “This weekend will be another difficult match. “We’ll need to work just as hard to try and get the three points.